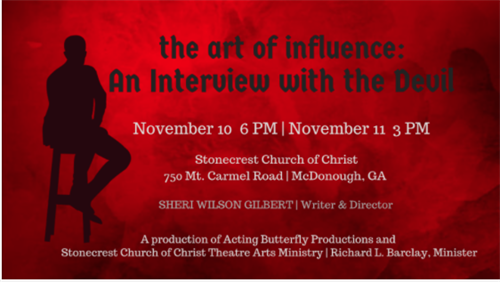 A Christian Play written and directed by Sheri Gilbert Wilson. It explores conniving and creative ways the Devil exerts influence to cause havoc, chaos and turmoil inthe lives of four families. The dramatic musical production offers prolific and valuable insight into how our weaknesses, both physical and spirtual, can be exploited to lead us to our own destruction. The play offers hope, inspires courage and provides ammunition for those who chose to fight the good fight. Join us Saturday, November 10th at 6pm or Sunday, November 11th at 3pm. The play is FREE and open to everyone. Stonecrest Church of Christ is located at 750 Mt. Carmel Rd, McDonough GA.